Resistance is futile…you will be Assembled! I totally and shameless just stole my title for this blog from the winner of the Evomics t-shirt competition in 2012 for the Workshop on Genomics. Even in 2014 assembly is still a difficult process and Rayan highly recommends the GAGE 2012 benchmark paper as a good read illustrating the difficulties in obtaining good assemblies and how at the moment there is no ‘best’ de novo assembler out there right now. Another paper I found evaluating de novo assemblers is from PLoS ONE and cites the GAGE paper: Vezzi F, Narzisi G, Mishra B (2012) Feature-by-Feature – Evaluating De NovoSequence Assembly. PLoS ONE 7(2): e31002. There is no single program right now that is considered ‘the assembler’. Different assemblers have advantages and disadvantages as well as things they are generally useful and not useful for. Assembly: Set of sequences which best approximate the original sequenced material. One of the important things that you need to know for assembly is what a k-mer is. A k-mer is any sequences with length k.
You hopefully get the idea. 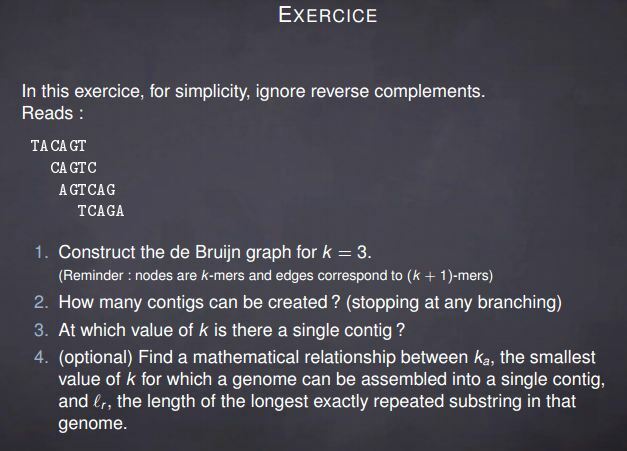 There are two essential methods that assemblers use to assemble: de Bruijn graphs and overlap/string graphs and Rayan had some excellent slides illustrating how this all works so I will be putting some of those up; but I highly encourage you to review his slides. So first you start with the beginning nucleotide and go 1, 2, 3 then you put an arrow and start with the next nucleotide ‘C’ and go 1, 2, 3. You cannot go further because starting with T wouldn’t give you 3 nucleotides, it would just be TG so it is not a k-mer of 3 therefore isn’t in the graph. Get it? Ok lets go in reverse…how do you construct a sequence from a de Bruijn graph for this sequence above? Now CTG as you can see is a ‘node’ with more than one arrow leading/coming out of it, this means it’s repeated in the sequence we are trying to construct. So any contigs we ‘make’ have to stop at that node…remember how to reconstruct a sequence? Contig 1: ACT it has to end because it cannot include the node with the branch. Now all the nodes are used and no sequence contains a branched node. This is probably what you are familiar with if you use assemblers for 454 data. It essentially looks like an alignment. 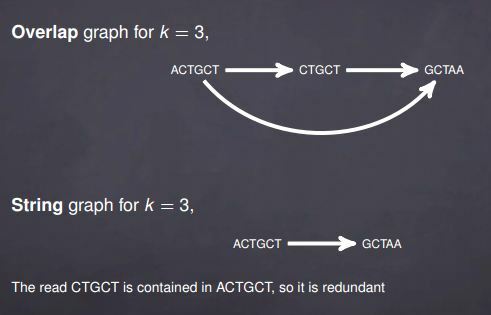 Point of information: A string/overlap graph cannot account for a mutation/substitution unless you tell it to (ie. allow 1 SNP error). 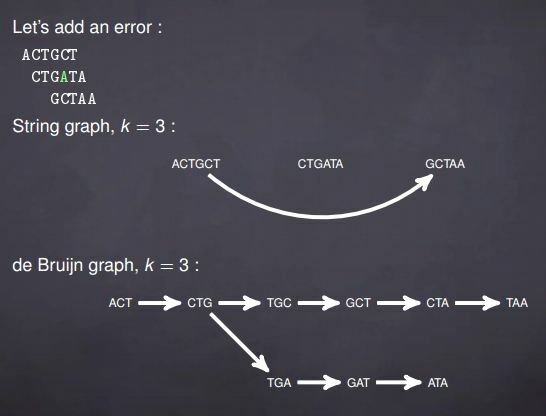 So as you see above a de Bruijn graph will simply branch off, a string/overlap graph will give you nothing–it can’t make the connections in the alignments because it cannot resolve or wasn’t told to ‘ignore’ the mutation. String/overlap is usually better if you have long reads (k-mers) as long as you adjust to allow for errors. For raw PacBio data, there are too many indels to input them to a string graph. The solution is to input corrected data. In theory assembly will find the path of minimal length that traverses each node (read) once. Contigs consist of ‘simple paths’ only…paths that do not contain a branching node. So multiple contigs can be constructed from a path. Unfortunately reality is rarely that simple; rather in practice we get a return of a set of paths covering the graph, such that all possible assemblies contain these paths. More recent metrics include internal consistency and likelihood of an assembly given the reads. QUAST is a good program to give you estimates on all these programs. Would you rather have an assembly of short reads with good coverage or an assembly of long reads with mediocre coverage? It’s difficult to rank assemblies but some of the criteria include: number of contigs or scaffolds, length of assembly, length of the largest contig, numbers of gaps, the N50 value, internal consistency and number of predicted genes. Recent software that was developed to determine Assembly Likelihoods include ALE and CGAL. Rayan also highlighted a blog post from Lex Nederbragt that talks about assembly uncertainty and gives suggestions. N50: The scaffold or contig length at which larger sequences cover 50% of the total assembly length. So you have an assembly with 3 contigs–one of length 3, one of length 4 and one of length 1. So the total length of your assembly is 8, while your genome is length 10. N50 then asks for the length (do you have a contig) of length 4 or greater? Yes we do. What if our genome size was 12 instead of 10? Trick question!! N50 ONLY deals with the length of the assembly. Ok now lets deal with NG50, also a metric of assembly same EXACT thing as N50 but now in reference to the genome. Now this one will change answers depending on your genome. Refer back to the figure above. In this instance when you don’t have a contig of exactly 5, you now have to find your two largest contigs–3 and 4. Do they add up to greater than or equal to 5? Yes, they add to 7. So now you take the SMALLEST of those two contigs and that becomes your NG50. This SMALLEST rule also applies to N50. So in the above example if the assembly had been length 10 and you didn’t have a contig of size 5, you would take the two largest contig that equal or are greater than 5. Once you’ve found them, take the SMALLEST of the two as your N50. In general for projects involving the human genome or on that ‘scale’ N50 should be 10-100 kb for contigs and 1-10 Mb for scaffolds in a good assembly. For bacterial ‘sized’ projects, N50 would be 100 kb for contigs and up to the length of the genome for scaffolds–assuming your bacterial genome is big enough to merit scaffolding. My viruses are super tiny…so contigs many times easily span my genomes. Really there is no ‘global’ metric for accuracy. Some assemblers look at the percentage of aligned blocks. Many of the assemblers in the Assemblathon paper were measure for ‘greatness’ based on the number of structural errors in the assemblies. As mentioned above, QUAST is a great tool for obtaining metrics of your assembly that you can compare to decide if it’s a good assembly. 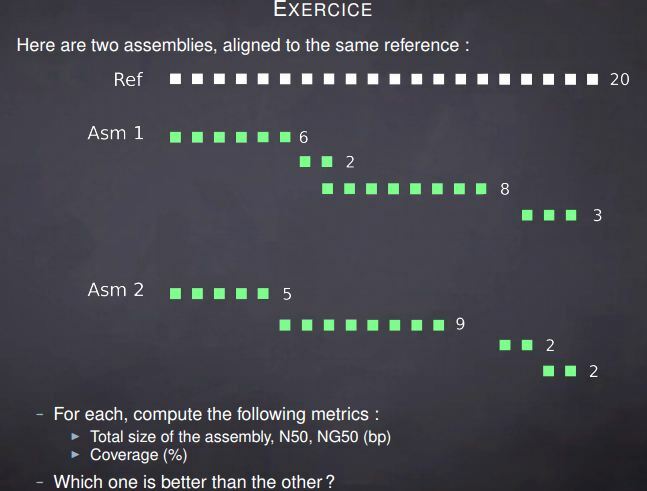 The assemblathon papers are a great resource for seeing what different assemblers can do with different data sets and are a highly recommended read. For RNA-seq Assembly you are looking at short contigs (average length 2 kb), uneven coverage most likely due to varying expression and alternative splicing and your contigs will be used more than once. It follows the same line as regular DNA assembly using de Bruijn graphs with the exception that it reuses contigs. Correction: Allpaths-LG is quite good, SOAPdenovo, QUAKE (high coverage mitigates the need to do the correction step. KmerGenie/PreQC: Optimal kmer size selection. Kmer size varies depending on dataset. 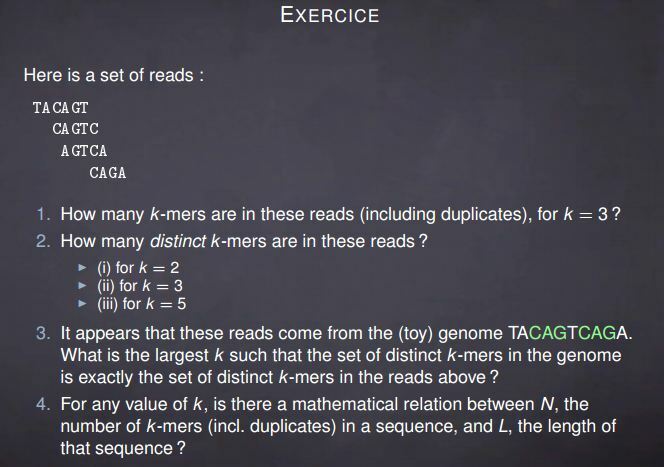 Keep in mind, (i) there is a lower limit (ii) also a high limit (iii) ideally you want to set k as high as possible to reduce erroneous kmers (iv) try at least 2 k values (v) Use KmerGenie or PreQC to help. Assembler: already discussed at length. Scaffolder: scaffolding maps paired reads to contigs to order them. Most assemblers include a scaffolder. Scaffolding is where errors are most likely to be made. You can use stand-alone scaffolders: SSPACE, BESST, Bambus2, Opera…or just skip scaffolding because many times contigs are good enough. GapFiller: Fills gaps inside scaffolds. A few assemblers include gap filling (ie. SOAPdenovo2, Allpaths-LG); GapCloser (a part of SOAPdenovo). Or you can use GapFiller or FinIS but they have limitations. k-mer size will vary: At a low limit k-mer size (when you get ‘too’ low) then depending on the size of your genome you’ll start getting many repeats which will make assembly difficult. At a high limit make sure you have good error correction. Typically use a value of k = readlength -1. Ideally k should be set at the highest level where you have greater than 2 error free k-mers. Additionally, it is good to assemble with more than 1 k value and if you have absolutely NO idea where to start. Start with k = 25 or k = 30 unless you are dealing with uber short reads. And move on from there evaluating k values. Error correction: Make sure you correct your errors! Make sure low quality reads are removed and trimming has been done prior. If you have a large genome, scaffolding is recommended. And if things get difficult with your organism…perhaps yelling “Resistance if Futile! You will be Assembled!” will help…if not well, now at least you’ve gotten some odd attention from you lab mates who will probably give you plenty of space now for a bit. Whoa.. great blog post Mel! In general, your coverage of the workshop is impressive.